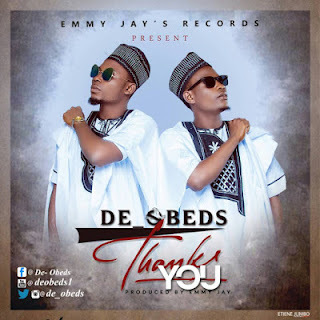 De_Obeds, Niger Delta super stars 2016/2017 edition has finally released their promised hit single "Thank You" . The duo are great multi talented singers who are very unique in their appearance as well as their captivating voices which is capable of taking you into an atmosphere of relaxation, making you feel worm and excited at the same time De_Obeds are known for their dance songs as they are also capable of wowing you with their afro hip-hop, rock, worship, jara and other genres of music. "The two brothers are always backed up by the holy spirit whenever they minister", these are some of the words of people who have been under their ministration.